Luckily for you humans A Band of Orcs have now released New Music for Friday, March 13th in defiance of your foolish superstitions. For the first time since the Madness at the Core of Time Tour, the creatures in A Band of Orcs will raid with D.R.I., Angerhead, The King Must Die, and Cultural Warfare at the Back Bar in San Jose, California Realm on April 3rd. 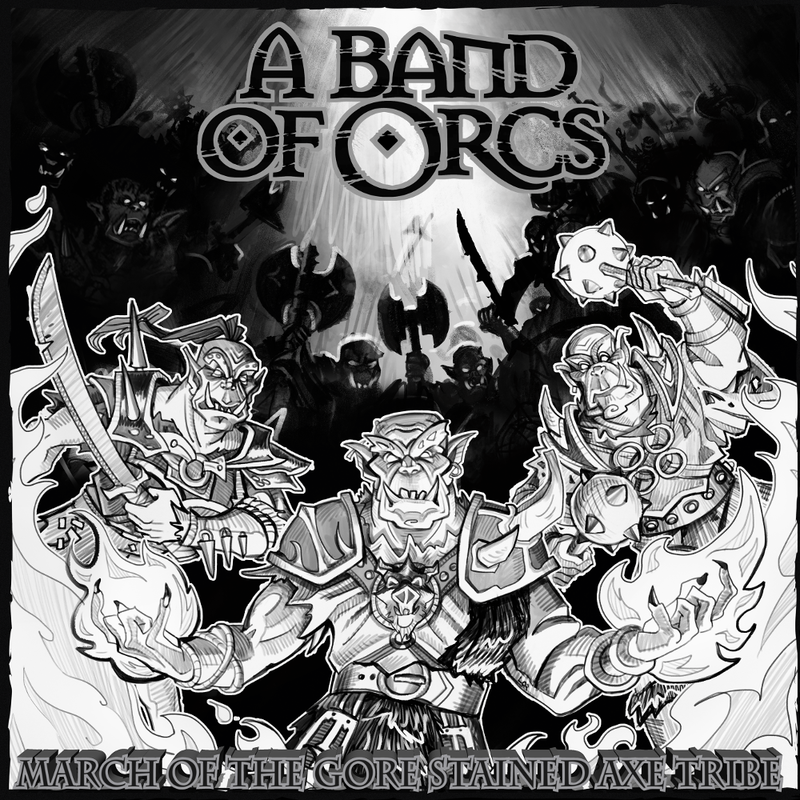 Ahead of their return to the battlefield A Band of Orcs have begun beating the wardrums and have unleashed a Digital Triple Shot available exclusively on their BandCamp page for your bloody enjoyment. Formerly a 5-piece war machine, A Band of Orcs returns on this recording with Oog Skullbasher, Cretos Filthgrinder, and Gronk! the Shaman, as a death metal trio in the wake of the demise of two former WarChiefs. The “March of the Gore-Stained Axe Tribe” demo is a warning flair to humanity signaling the savagery to come in early 2016. Recorded at Trident Studio with Engineer/Producer Juan Urteaga (Machine Head, Testament, Hatriot), Gronk! the Shaman takes the high road handling the bardic scream-cantations, while axe-wielder Cretos Filthgrinder takes the low road, fielding the Gutteral verses in this dual vox frontal assault. Oog Skullbasher continues to administer the tribal beat downs in the latest battle hymns to arise from Orc Tower. Track 1: “Chata Urklud Cruaksi” is a traditional battle chant of the Gore-Stained Axe Tribe, delivered in the native Hirntodian Uruk tongue, accompanied by Oog’s drums of war and the instrumental sorcery of Cretos and Gronk!. “March of the Gore-Stained Axe Tribe” translates some of the Orc language battle chant into Humanese, incorporating pieces of lore from the founding of the Gore-Stained Axe Tribe into the tale. Track 3: “Heaving Death” is the name of a plague found in Hirntodia. The song relates how Cretos became orphaned from his original people, the Twin Blades Tribe, when the yellowed-robed priests of the pestilent sign sailed their black ship into the harbor of his former home, Trito Craa Sertrob, unleashing the alchemical plague upon his once mighty folk, utterly decimating them. Suddenly cast adrift from his former people, this is the reason Cretos came to fight his way into the Gore-Stained Axe Tribe.